I’m promise this is (sort of) the last post where I’ll talk about my blisters. Maybe I’ll mention them in the next post. 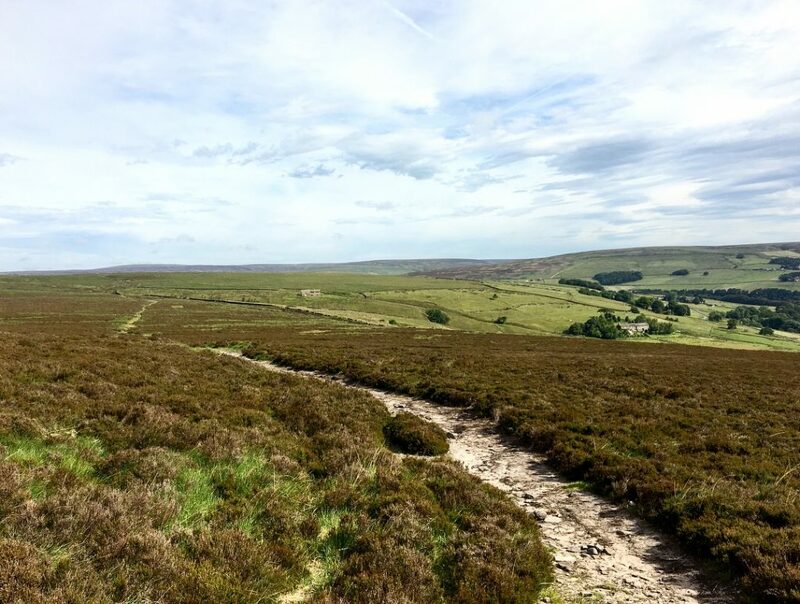 But I’m not sure how else to lead off a post from this fourth day of walking on the Pennine Way, from Hebden Bridge to Haworth, without making it pretty much all about my blisters. Because this day was all about my blisters. 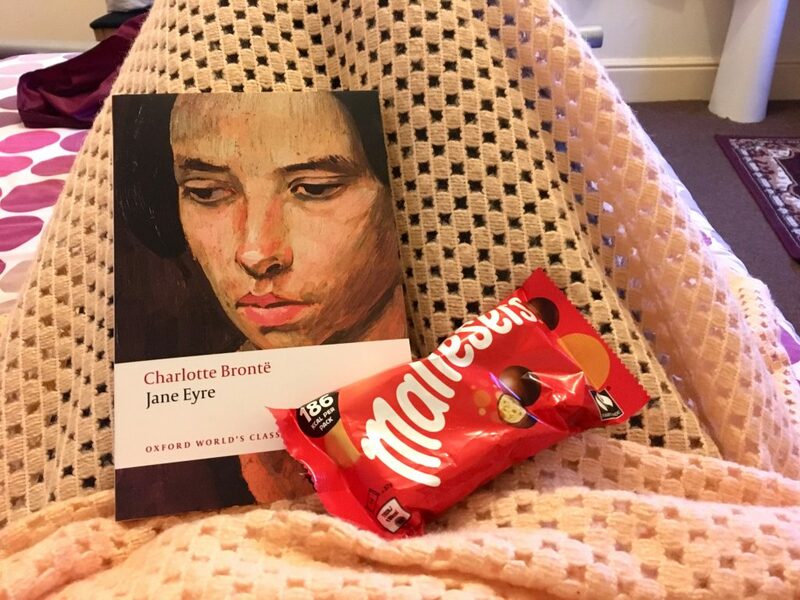 Blisters, and Jane Eyre. But Jane comes later. I’d woken up early- after a decent night’s sleep in my private room at Hebden Bridge Hostel- and after packing my things I went downstairs to take advantage of the complimentary breakfast. I’d bought some yogurt the day before, and along with a hot cup of coffee and a big bowl of cereal that the hostel provided, I felt ready for my day ahead. What I remember most about leaving the hostel is that, on my walk back along the canal and heading out of town, I had to stop and adjust the bandages on my toes. I wasn’t even 20 minutes into the day’s walk and I had my pack opened before me, my little medicine bag open, my socks and shoes off. Once the blisters were re-wrapped I was again on my way, but my steps were still painful. It wasn’t impossible to walk- not at all- but the pain was ever-present. But worse than the pain was my worry over the carefully planned itinerary I’d set for myself. I was going to walk the Pennine Way in 15-days, and this is a slightly ambitious plan but one that I thought I could manage. (In hindsight, if I were doing this over I’d give myself a minimum of 17-days, but I’ll save that post for another time). 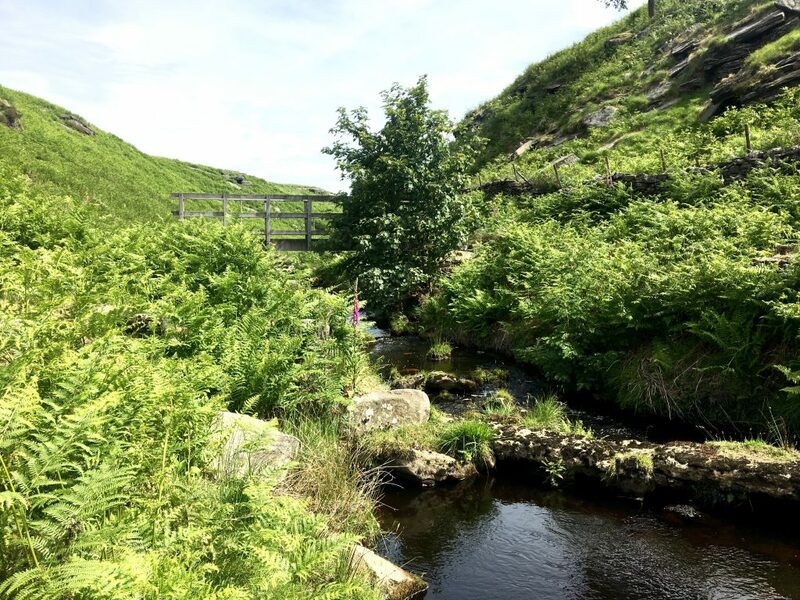 One of the issues with my itinerary was that I’d planned a 26-mile day for myself towards the beginning of the walk, the entire reason being that I’d wanted to detour to Haworth. The details here aren’t important, but basically, the detour meant that I’d have to cover a whopping 26-miles the next day if I wanted to keep on track and finish the walk in the time that I’d allotted. 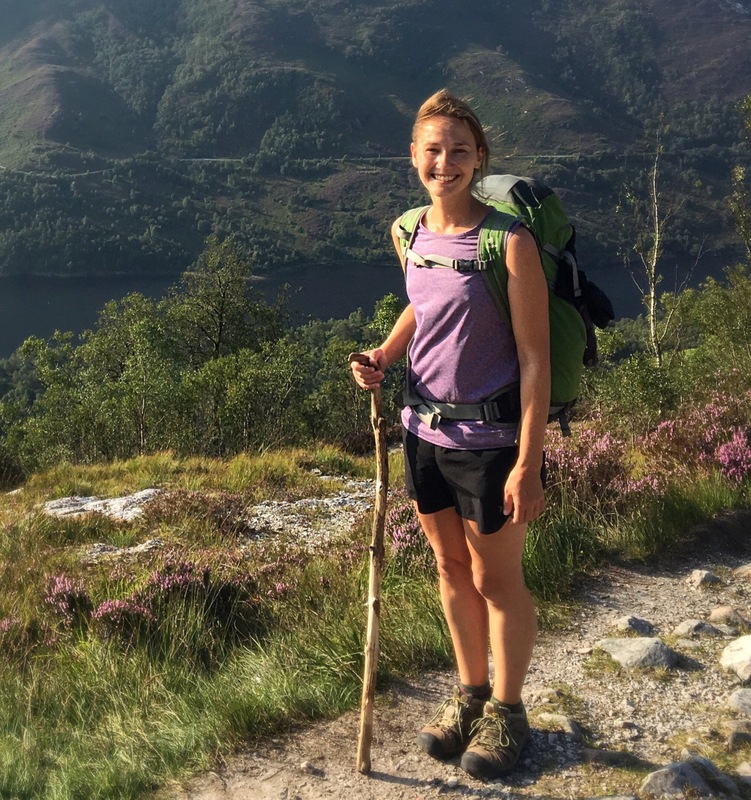 On a good day- weather wise and with feet and legs in good working condition- 26-miles on the 5th day of a long walk would be difficult, but possible. 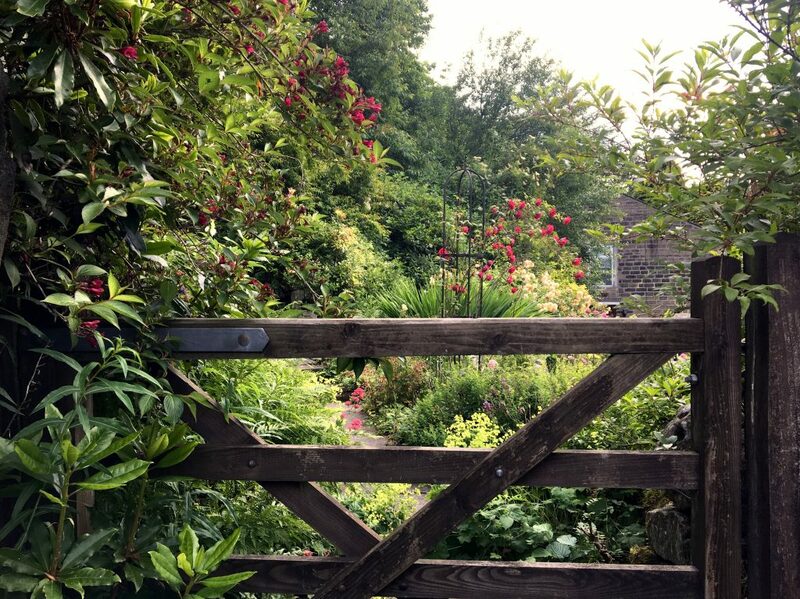 But as I walked out of Hebden Bridge that morning, my four little blisters crying up to me with every step, I couldn’t imagine how I’d be able to accomplish what I’d set out to do. And stopping in Haworth was a priority. 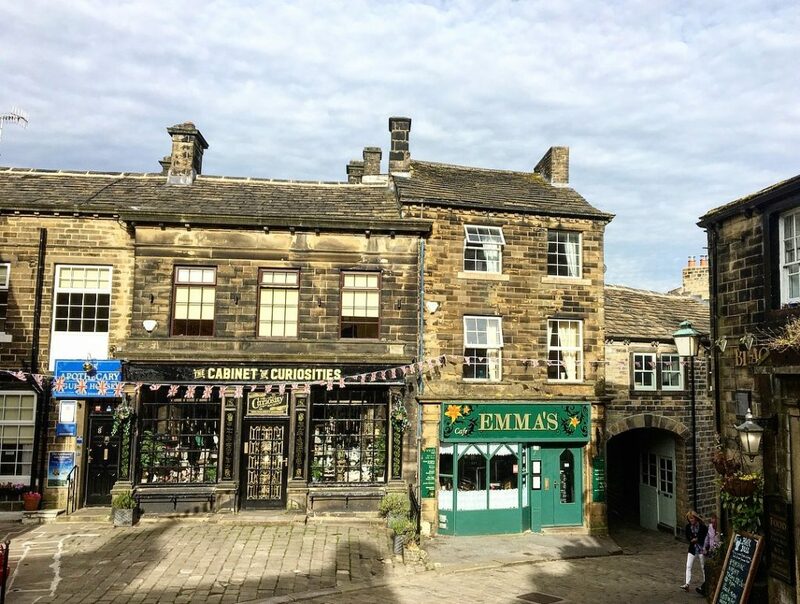 Haworth is the home of the Brontës, that great literary family of the nineteenth century, and while I haven’t read all of the works from Charlotte and Emily and Anne, I adore the story of Jane Eyre. I’d also heard about the family’s home- the parsonage- and once, years before, I’d seen an old photograph, a grainy black and white image of a solid old home set against a wild and stormy sky, surrounded by open, empty fields. “I’d like to go there one day,” I said to myself. When I was researching the Pennine Way and discovered that Haworth was just a few miles detour from the main path, I knew I’d have to work this into my plans. But since the 26-miles wouldn’t be until the next day, I decided to push that detail out of my mind and focus on what was around me. And despite the blister pain, and despite how the path began to rise rather steeply as I made my way off the canal and through the hamlet of Mytholm, I loved the path. 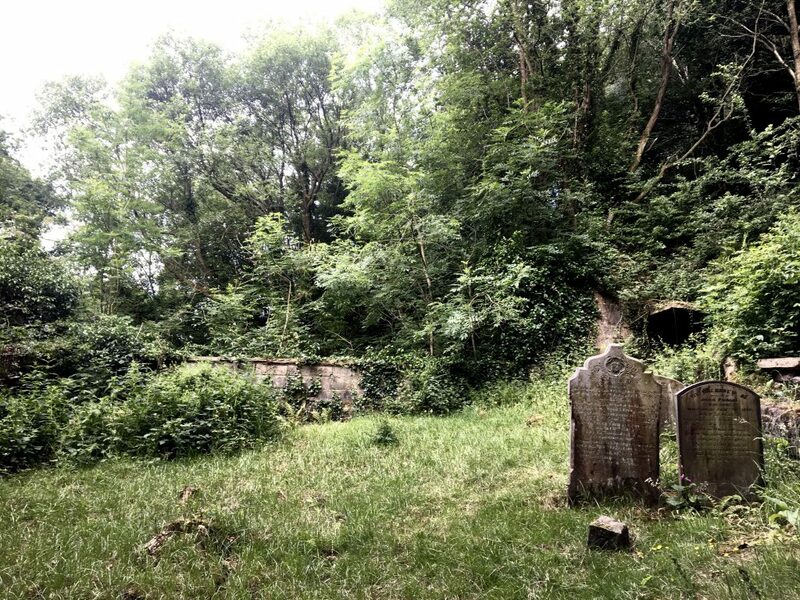 There was something really beautiful about the morning, about the dark and quiet little cemetery tucked into the side of the hill, about the way the path narrowed and curved around tiny waterfalls and stone cottages, steps tucked into the dirt, how flowers seemed to spill out onto the path- a burst of red and pink and white. Once I climbed well away from the canal and passed through a series of farms (and an orchard! ), I entered Heptonstall Moor, the first true moorland of the walk. Ahh, now this was what I had been waiting for. There is just something about an open landscape, about the wide skies and the fields that stretch to the horizon, and the feeling of vastness and freedom. It’s my very favorite kind of walking. 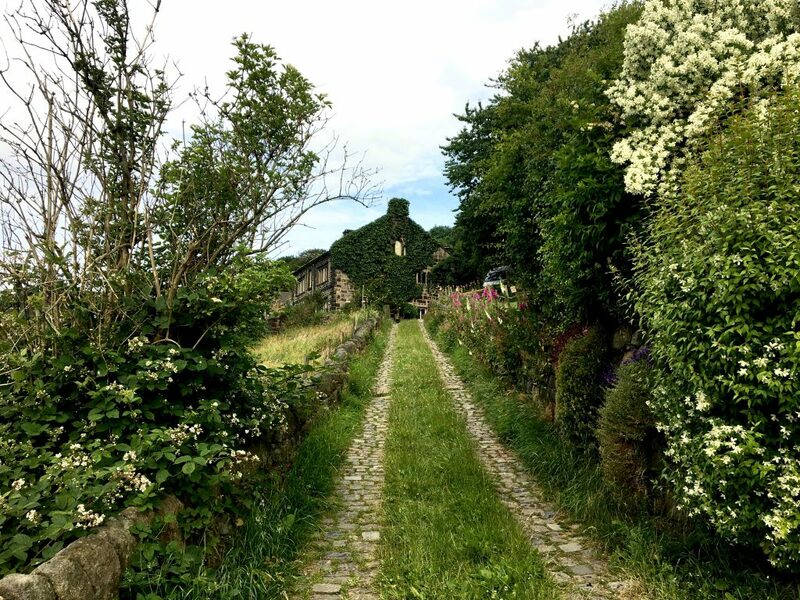 I’d discovered this back when I walked the Camino Frances and really loved the Meseta, and on the Norte with all those sweeping coastal views, and the Aubrac Plateau on the Chemin du Puy. But it was crossing through moorland on the West Highland Way that had me researching other walks through the UK. “I want more of this moorland,” I’d said to myself. And here it was. A winding, faint path through the heather, stone slabs appearing occasionally to prevent wet, muddy feet and to help guide the way. 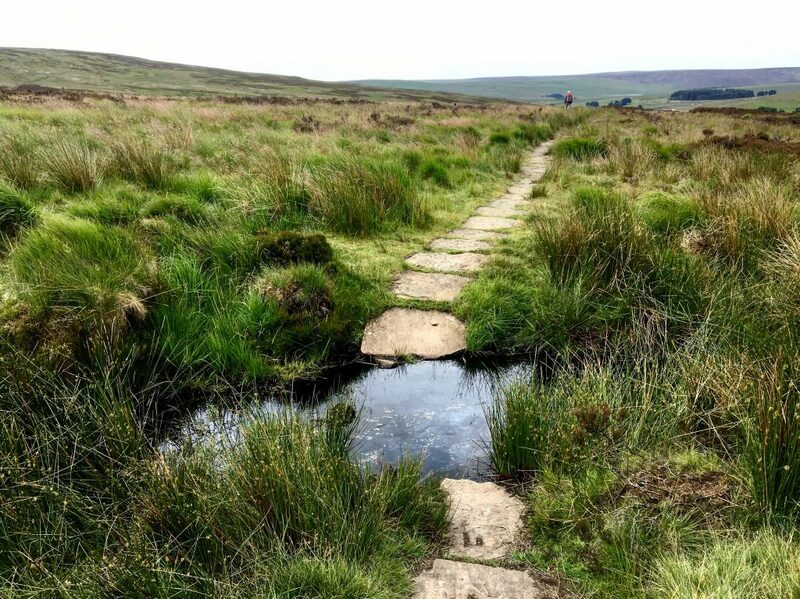 I stopped in a grassy spot by a creek for a snack- a banana, a handful of dried apricots, a few rounds of Babybel cheese- and then continued walking through the moorland, on service roads and past reservoirs, on grass and dirt and more stone slabs. 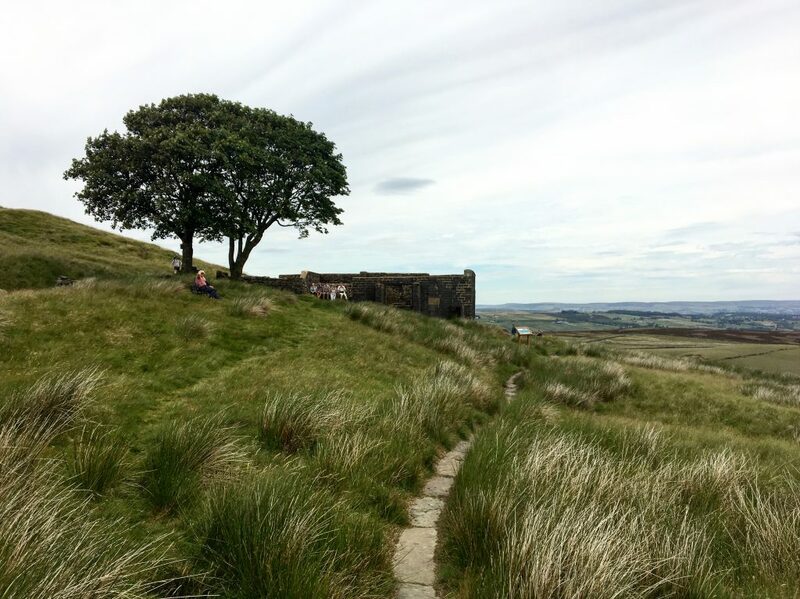 Eventually the path wound up to Top Withens, the farm that was supposedly the inspiration for Emily Brontë’s Wuthering Heights (this is greatly debated and totally unproven, but accuracy aside, Top Withens has become associated with Wuthering Heights and is quite the tourist destination). I’d been alone all morning long, passing the occasional hiker, but now that I’d arrived at Top Withens it seemed as though everyone else had, too. I walked around the remains of the old farmhouse and then found a quiet spot on the hill behind the building and ate another snack. The skies were overcast that day, and I started to get cold there on the hillside, with the wind whipping around and I could imagine that Emily Brontë had walked here once, or maybe a dozen times, among the weathered stone and gnarled tree branches and dreamt up her dark tale of Catherine and Heathcliff. The path detours just after Top Withens, with the Pennine Way carrying straight on and the detour to Haworth descending down to the right. I had about 3 1/2 miles to go, and most of the way was pleasant, but the last bit of walking on the road had my blisters roaring again. But I could see the town of Haworth in the distance and it was early afternoon when I arrived, giving me plenty of time to check into my B&B and then head back into the town for some site-seeing. I was staying in the Apothecary Tea House which was right in the center of the town, in a quaint square filled with shops and restaurants. 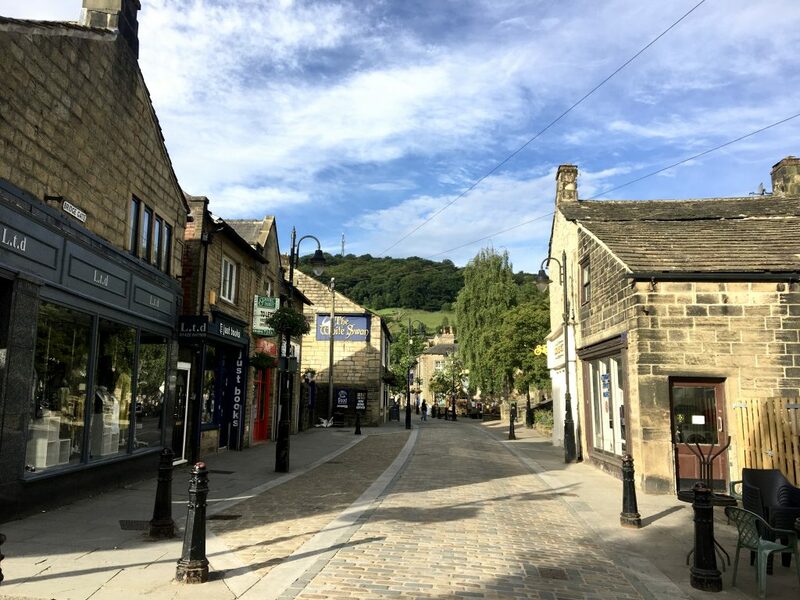 Haworth has a youth hostel and when I was planning my itinerary I think the hostel still had open beds, but it was located a mile and a half up a long hill on the way out of town, and I decided that I was going to splurge on a B&B. And I’m so glad that I did! The staff were among the kindest of any that I’d met on my walk; the owner greeted me when I arrived and when he found out I was from Philadelphia, referenced every song and movie he could think of (and then told me more at breakfast the next morning). I was taken up to my room and even though I had only been walking for 4 days, the room felt like an oasis. A big soft mattress and extra blankets, a sink in the corner of the room with a fluffy hand towel (and a full bathroom that I had sole use of, with toiletries and more fluffy towels), a large window that overlooked the town, a hot water kettle and a tin full of tea. 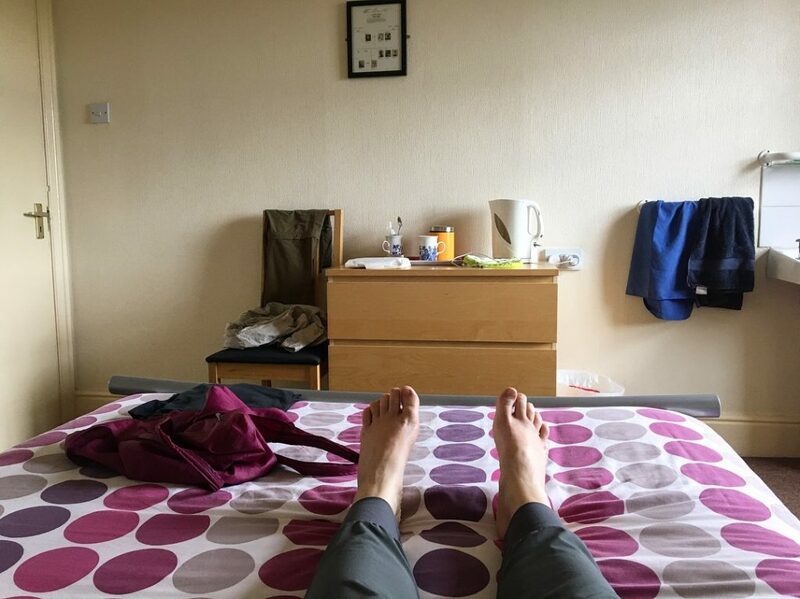 I took off my shoes and socks and made a mug of tea and stretched out on the bed before I did anything else. After my shower I headed back out, but before touring the Brontë parsonage I made a stop at the tourism office. I’d made a decision when I’d been up in my room drinking my tea. When checking in, the owner of the B&B asked what time I’d like to have breakfast the next morning. “What’s the earliest time you begin serving?” I asked. I told him that 8:00 would be fine and then I set about coming up with a Plan B for the next day. I knew I’d never be able to walk the full 26-miles if I started at 8:00am, especially if my blisters were slowing me down. Haworth had a train station, so I figured that there must be a way to skip a portion of the path. 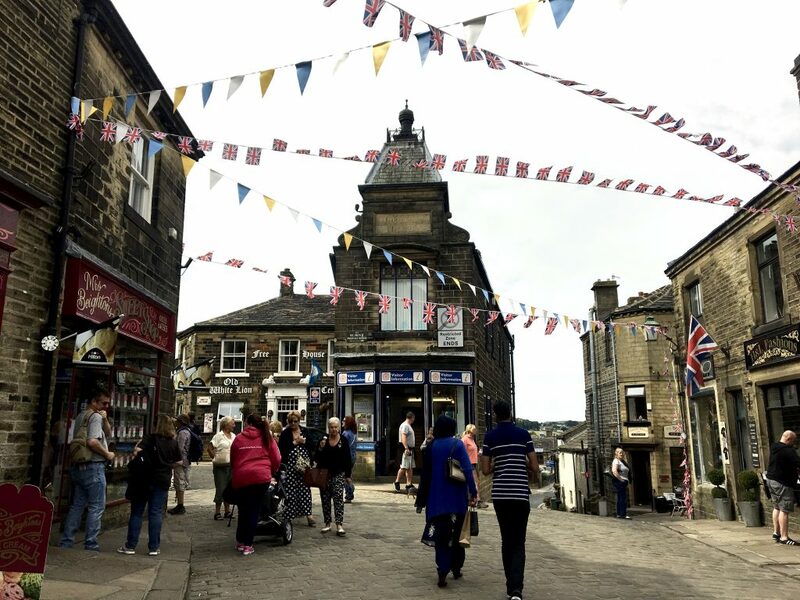 In continuing with the trend of ‘Haworth as the friendliest village just off the Pennine Way’, the women at the tourism office spent a good 20 minutes with me in order to figure out a plan. They gave me multiple maps and timetables and made phone calls and wrote down train numbers and assured me that not walking 26-miles was absolutely, positively, the right thing to do. Initially, I thought that I might just be able to skip about 10 miles of the path, and still give myself a decent day’s walk, but after looking at options and considering the state of my feet, I settled on a plan that would cut out nearly 20 miles of my planned walk. I’d still have about 6 to do, but it would practically be a rest day, and maybe it would even give my feet a decent shot of healing. 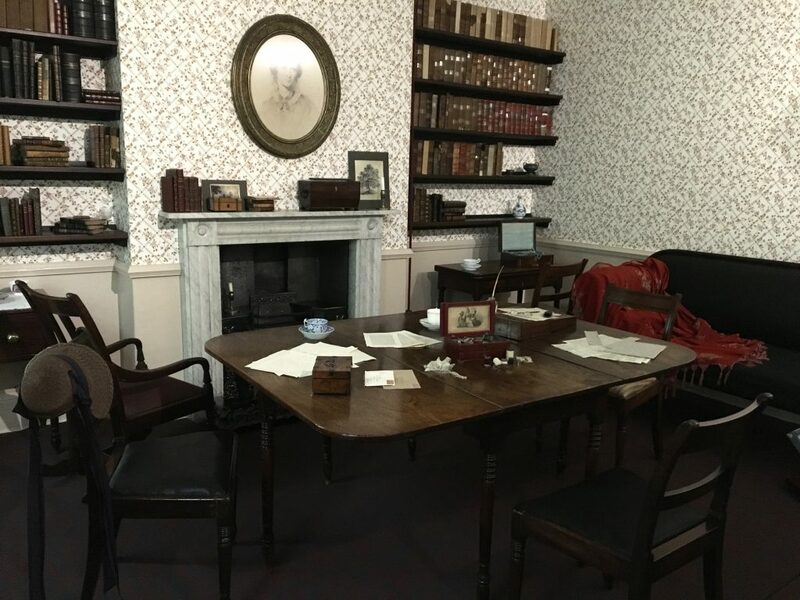 Armed with a plan and the friendliness of the village of Haworth, I bought a ticket into the Brontë parsonage and of course everyone there was friendly and helpful too. The man who greeted visitors as they entered the house followed me around the rooms for a bit; I’d come during a quiet pocket of time, and as I walked from the drawing room to the kitchen to the dining room, he pointed out small details and told me interesting facts. The table where the sisters wrote each evening! This kind of site-seeing isn’t something I normally do during my long walks, but this time it felt just right. 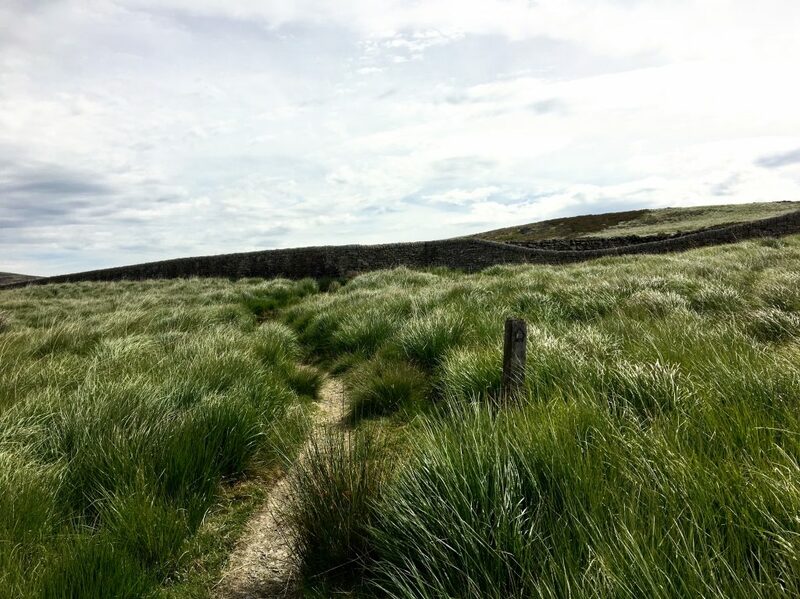 I wanted to learn more of the Brontë sisters, to see where they lived and wrote; I was, quite literally, walking in their footsteps through this part of the Pennine Way, and I wanted to immerse myself into their world. On my out of the parsonage I stopped in the gift shop and bought a 488-page copy of Jane Eyre. My pack was already heavy- was I crazy to add this very unnecessary weight? I read the first few chapters that night, in my cozy room in the center of Haworth, a mug of hot tea and a bag of chocolate candies and if I’d had any dreams that night, I think they were probably full of the wild and windy moors.